As well as many other dishes from various parts of the world, paella evolved from local produce. It is estimated that its preparation began between the fifteenth and sixteenth centuries, when the inhabitants of some of the rural areas of Valencia started to mix the different ingredients they had available to make a fast and easy meal for the farmers and shepherds. In principle, they added fresh vegetables to rice with chicken and rabbit, as well as saffron and olive oil, ingredients that gave it its characteristic flavour of the Mediterranean. 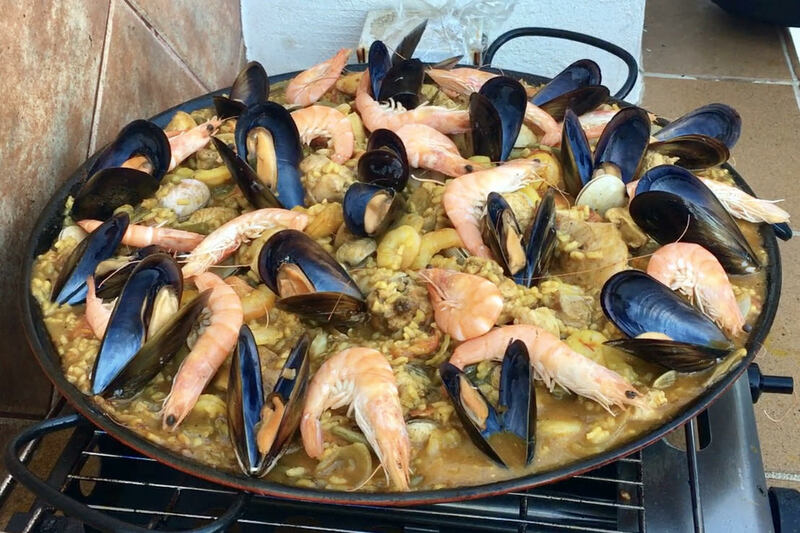 As paella became more popular, seafood and shellfish were added. There are many stories that revolve around this mythical Spanish recipe, one of them tells that it is a dish that was usually consumed in the evenings. Another legend, dating to the Spanish War of Independence, relates that a French general, impressed by the exquisite taste of paella, told a woman that "for each new plate of rice cooked he would free a Spanish prisoner." In the end, the military had to release 176 prisoners. The exact origin of paella, pride of any Valencian, is located in the rice area near the lake of Albufera. Olive oil and saffron, essential ingredients for its preparation were added to the original recipe. Similarly, the farmers of the time, in addition to the meat and vegetables they had on hand, incorporated tavella and ferraura (two native types of green beans) and garrofó (a flat and white bean), as well as paprika, rosemary and snails. This dish, one of the most famous in Spain, owes its name to the frying pan in which it is cooked called a "paella" or "paellera". The shape of this pan should be a minimum diameter of 30 centimeters, with edges of 7 to 12 centimeters, not very deep, with two handles fixed to the sides that support the stew and allow it to be transported easily. For an authentic Valencian paella, the Ministry of Agriculture of the Valencian Government has decreed that ten ingredients must be included, chicken, rabbit, basil (green bean), garrofon, tomato, rice, olive oil, water, saffron and salt. However, garlic, artichoke, duck, paprika, snails or rosemary can also be added. Over time, other variations have been created of which "paella marinera" is the most popular and accepted. In this one vegetables and meat are replaced by diverse seafood, molluscs and fish. (In addition to supplying the water for fish stock - not sure about this bit!). Another type of paella is "mixed" in which, as it's name suggests meat, chicken or rabbit is mixed with seafood. This recipe is rarely consumed in Valencia but will be found in most non-Valencian or foreign restaurants. 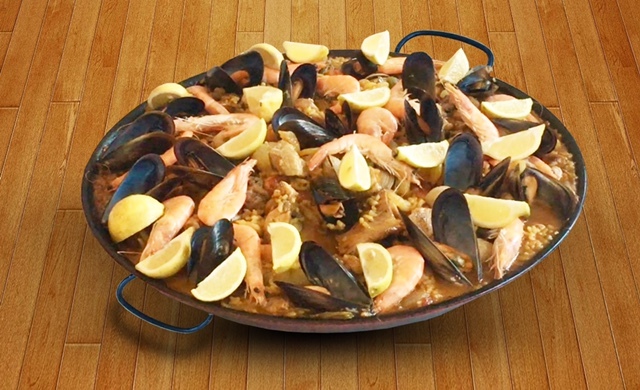 Paella alicantina" is made from a broth, which contains fish (sepia, prawns and swordfish) and meat (chicken or rabbit). Its elaboration originates from the south of Valencia, especially in the counties of l'Alacantí-Alcoià or the Foia of Castalla. Paella became famous first in Spain, and began to spread to other cultures and countries such as Belgium and France after the nineteenth century. Its rise in most continents was mainly due to being a festive dish that became common in family gatherings, and was born to gather people together and to celebrate.